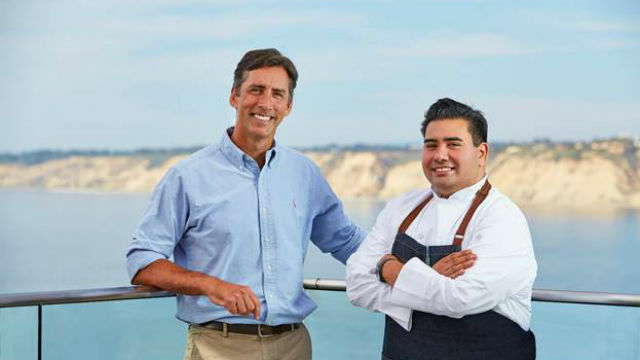 Duke’s La Jolla General Manager Shaughn Helliar and Executive Chef Anthony Sinsay outside the restaurant. A San Diego- and Maui-based restaurant group has opened one of it’s iconic Hawaiian restaurants on Prospect Street in La Jolla. Duke’s La Jolla officially opened Wednesday at 1216 Prospect. Other Duke’s locations are in Maui, Waikiki, Kauai, Malibu and Huntington Beach. The 13,000-square-foot restaurant features two dining areas including the main level with seating capacity of 230 and a second level with seating capacity of 150. Both floors offer outdoor dining. The lower level evokes a La Jolla cottage atmosphere. The upper level, known as Boomer Bar, features a casual 1960s surfer’s garage with communal bar tables and surfboards stored in the rafters. Signature menu items will include Tahitian Octopus cooked on a wood grill with smoked papaya, cucumber, lime and coconut milk; Charred Snap Peas with burnt pineapple vinaigrette and brie; Lilikoi Ceviche with coriander stem, tomato, avocado, Fresno chili; Roasted Firecracker Fish with Suzie’s Farm cabbage, gailan, ginger sprouts; and 24 Hour Kalbi Short Rib served with house made kimchee, smoked potato salad and Kewpie yogurt. Founded in 1977, T S Restaurants owns and operates 14 restaurants in Hawaii and California, including Jake’s Del Mar.